The Defining Concept of Digital Book History? The following are comments shared by Kyle Roberts, Director of the Jesuit Libraries Provenance Project, at the American Historical Association Annual Conference on 4 January 2019 on “Digital Approaches to Book History,” a roundtable sponsored by SHARP. Problem: What is the defining concept of digital book history? the defining concept of book history is around understanding the social impact of books; we have moved on from the emphases of twentieth-century historical bibliography, which had a strong focus on enumerative and textual bibliography and the need to establish the record of what was produced, to wanting to understand what influence these things actually had on their contemporaries and on subsequent generations. As a historian of the book who has focused on library history for the last decade, I am sympathetic to Pearson’s exhortation to explore the influence that books have on their contemporaries and subsequent generations. I am also a digital humanist, a scholar committed to using computational methods to open up complex analog sources for meaningful analysis. I’ve learned first-hand that book history has its share of difficult-to-use analog sources. The Jesuit Libraries Provenance Project, which over three dozen Loyola University Chicago students and I have worked on since 2011, reconstructs the original (c.1878) library catalog for St. Ignatius College, precursor to present-day Loyola University Chicago, in a virtual library system as well as creates a digital archive of provenance markings for over 1750+ surviving titles from the original collection. In creating the VLS and provenance archive, a great deal of enumerative bibliographical work was undertaken. There are vastly more examples to follow of historical collections built using Omeka than there are of argument-driven historical scholarship using digital methods. Digital projects may begin with a focus on producing purely academic research, but many ultimately end up taking the form of online exhibits or collections of primary sources. In neglecting to make explicit historical arguments from this data, Blevins argues, digital historians have failed to further our collective understanding of the past. Truth be told, JLPP right now sits in the corners that Pearson and Blevins write against: more enumerative bibliography than social history, more online resource than argument-driven interpretive scholarship. I know we’re not alone in this regard; this is a common condition for digital book history projects. It is worth briefly reviewing just how profoundly digital platforms, sources, and tools have changed the way book historians have studied material texts over the past few decades. Authoritative catalogues of individual works – such as the ESTC, Evans / Shaw-Shoemaker, and WorldCat – early on migrated from printed to online resources, providing the basic building blocks for book historians. Scholars can exploit the rich metadata of these records to create new visualizations and understandings. Virtual library systems – such as What Middletown Read, Australian Common Reader, Easton Library Company Project, and CityReaders – have made difficult-to-use analog records easily searchable and accessible for analysis, showing us what individuals and communities collected, classified, and borrowed. Provenance projects – such as Provenance Online Project, Footprints, and Book Traces – have documented the range of markings within material texts, revealing where books were acquired, who owned them, and the ways people used them. Printing and book trade databases – such as the Atlas of Early Printing, French Book Trade in Enlightenment Europe, and Mediate – visualize the development and movement of new and secondhand printed works over time and space. Circulation studies – such as Viral Texts – trace the movement of discrete textual passages across the corpus of printed works. Databases of reading – such as the Reading Experience Database – captures the many ways and places in which individuals and communities engaged with material texts over time. Social network analysis – such as Shakeosphere – has exposed the surprising connections between printers, publishers, and authors. Blevins and Pearson are thus right to some extent: while we have witnessed a proliferation of database building, we have seen fewer examples of scholarship that has come out of them. I should say I don’t think this is for want of interest. There are many factors – time, labor, funding, platforms – which make digital book history projects more challenging to complete than traditional research. But should we be doing more? Say we embrace the charge to move beyond the creation of digital archives and databases to write new, argument-driven digital histories focused on the social impact of books. Say we accept this as the defining concept of digital book history. How do we do it? What should those histories look like? We have a handful of examples of interpretive histories derived from digital book history projects. Frank Felsenstein and James J. Connolly’s What Middletown Read: Print Culture in an American Small City (2015) uses the virtual library system of the same name to argue for the importance of print at the end of the nineteenth century within social patterns of community life in a provincial Midwest city. While Felsenstein and Connolly write from the database they created, Richard Coulton, Matthew Mauger, and Christopher Reid mine the Old Bailey Online, a collection of digitized London court records, for evidence of book theft in their volume, Stealing Books in Eighteenth-Century London (2016). Yet these works are the exception rather than the rule. The international AHRC-funded scholarly network Community Libraries: Connecting Readers in the Atlantic World, 1650-1850 convened in 2014-2015. It brought together over eighty scholars to explore the flourishing of a creative, unregulated period of social library development in the Atlantic World over two centuries before the modern-day public library movement. One of three meetings of the AHRC Network was devoted to digital library history, yet only three of the fifteen essays in the volume that Mark Towsey and I edited out of those meetings – Before the Public Library: Reading, Community, and Identity in the Atlantic World, 1650-1850 (2017) – were derived from digital book history projects. These are all examples of scholarship published through traditional mechanisms of commercial and university press printing. But should digital book history be presented in printed and bound monographs or should it instead be on the same digital platforms used to reconstruct and research these book histories? Can we push our platforms to go further, to couple historical argument with interactive discovery? As I think through how to present our interpretive findings from the Jesuit Libraries Provenance Project, can we do it in a way that bridges access and argument, digital and analog? From the start, my students and I decided the Jesuit Libraries Provenance project would be an open and evolving work of history because our digital platform allowed us to do that. We published our sources, methods, and findings as we went, rather than holding them until we had more polished analyses. Such an approach was important in reaching audiences touched by the history of these books, in particular descendants of original donors or former Loyola students, who might have more information about them. I’d say an important challenge for digital book history is keeping this open and evolving sense of discovery and connection between the original source material, method, and historical interpretation, inspiring further scholarship. We might even ask if it is our responsibility to produce scholarship in a publicly accessible manner? What is our responsibility as digital book historians who created these projects, often with public money? As I enter 2019, I wrestle with how we to bring to the broadest possible audience the insights that we have had from the Jesuit Libraries Provenance Project, now that much of our data collection for the St. Ignatius College Library is nearly complete. Should it be a printed monograph? Should it be a digital publication? Should it be embedded within the VLS and provenance archive? Should it be a whole new site? If we want to go digital, we don’t have many examples to go on. The Viral Texts project provides a best practice model, having published several articles and has a contract with University of Minnesota Press to write a volume in their Manifold series. In the end, I have asked more questions than provided answers. Let me end with a final question: Should the defining concept for digital book history be argument-driven histories published on digital platforms focused on the social impact of books? Or is that too tall an order? David Pearson, “The English Private Library in the Seventeenth Century,” The Library 13, no. 4 (December 1, 2012): 391. Matthew Kirschenbaum and Sarah Werner, “Digital Scholarship and Digital Studies: The State of the Discipline,” Book History 17, no. 1 (2014): 410. In his final post, Eric Berner explores books of law that could have been used in the common school classroom. These are works that likely would have received the most attention from St. Ignatius College Students. A huge thanks to Eric for a great series and the best of luck as he heads off to law school. We hope his work on the JLPP has taught him a thing or two about the law! John S. Hart, A Brief Exposition of the Constitution of the United States (Philadelphia: 1871). John S. Hart, A Brief Exposition of the Constitution of the United States (Philadelphia: 1874, Eldridge & Brother). Edward Mansfield, Political Grammar of the United States (Cincinnati: 1846, W.T. Truman). Furman Sheppard, The Constitutional Text-book (Philadelphia: 1855, Childs & Peterson). Charles Stearns, A Concordance to the Constitution of the United States of America (1872: New York, Mason Baker & Pratt). Joseph Story, A Familiar Exposition of the Constitution of the United States (1858: New York, Harper Brothers). Nineteenth-century common schools offered the children of the less-than-elite a basic education in reading, writing, and math. They also taught topics like American history and law, as well as Protestant ethics, intended to instill values of moral citizenship. Horace Mann, a Whig politician from Massachusetts, is often credited as the leading advocate for these schools, the first true public education system in the United States. The Jesuits who founded St Ignatius College had their own pedagogical system for educating the sons of Chicago’s They shared an emphasis on religious ethics and grooming children to be citizens. This makes it unsurprising that St Ignatius would have had two copies of Hart’s book. An image of the title-page of the 1879 edition of Hart’s classic work. St. Ignatius College’s original catalog lists a copy of Edward Mansfield’s The Political Grammar of the United States printed in 1846 in Cincinnati by W.T. Truman, a publisher known mostly for printing schoolbooks. An earlier edition, from 1834, is held in Loyola’s Special Collections today. It’s publisher combined with its dedication, which reads “A complete view of the general and states governments with relations between them, dedicated and adapted to the young men of the United States,” would lead one to believe that the book was intended for educational purposes. 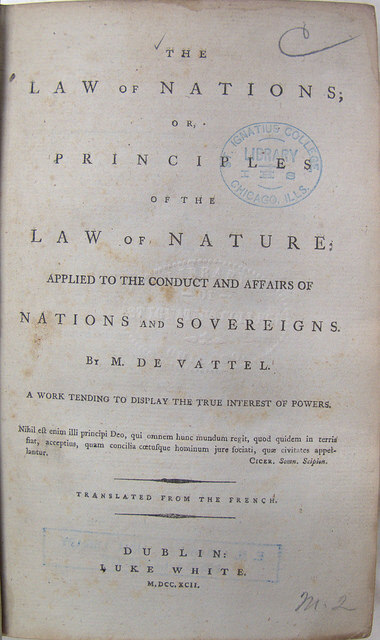 Though similar to a self-teaching book in its common-language explication of the law, Mansfield wrote his book while professor of constitutional law at Cincinnati College to benefit his students. Interestingly, Mansfield later left the college after a brief tenure to focus on magazine editing, where he was decidedly more successful. He is credited with introducing the American public to popular writers such as Harriet Beecher Stowe, while editor of Atlas and the Cincinnati Chronicle, according to his Wikipedia page. Mansfield’s goal in the Political Grammar is to instill in his students a thorough philosophical understanding of the rights behind the Constitution, how it came to be, and how it is applied through government, not just an understanding of its words or laws. Unfortunately for him (and the introduction in one particular edition on Google books says as much), Joseph Story’s commentaries came out just before Mansfield’s which soon became lost among the pack of the Harvard professor’s imitators and disputers. Loyola’s edition of Mansfield’s book, according to its ex libris, was originally owned by one Henry Boynton Sullivan, a lawyer from Maine. Charles Stearn’s Concordance from 1872, still held by Loyola. Another book explicitly intended for students (as judged by its subtitle indicating its inclusion of “Educational Questions” and the address in the preface) that Loyola still owns is A Concordance to the Constitution of the United States by Charles Stearns. The book itself is held by the Special Collections for reasons of safety; it is in the worst condition of all of the still-extant law books. The cover is peeling off and the pages are brittle and yellowed. Nevertheless, I was able to open it enough to scan its contents. Barely over 100 pages, the book consists of the full text of the constitution, followed by explications of major points in the document (Presidential Powers, the Treasury, etc) and an index of relevant terms and definitions. Though not much different from many of the other works of Constitutional analysis included in my previous post, its explicit address to students led me to include it in this post. There is not much to say about why the Jesuits would include it; they seemed keen to collect as many explications of US law, particularly the Constitution, as they could through gift or purchase. This almost would seem to be one of the least useful due to its short length and relative lack of information. Stearns’ Concordance was published in New York in 1872 by Mason, Baker, and Pratt. This publisher still exists, though, since at least the late nineteenth century, under the name Baker and Taylor Company. This company lasted for more than 180 years as an independently owned one. (It was in fact, ranked on a list by Forbes’ of most valuable independent companies in 2008.) Unfortunately, in a sign of the ever-monopolizing industry of publishing, the company was acquired just last year by – and absorbed into – Follett Corporation, which sells Loyola students their textbooks. Information was readily available on Stearns himself on Wikipedia. Educated as a surgeon, he practiced in New York and served in the medical units of the Union Army during the Civil War. Following the war, he became a carpetbagger, going to the South as a teacher and missionary and devoting more time to his writing on a wide range of subjects, including the conditions of blacks in the South and multiple works on Shakespeare, for whom he apparently had quite a passion. Also still held in the Special Collections is a decidedly better-kept copy of Furman Sheppard’s The Constitutional Textbook. This 1855 edition was published by Childs and Peterson in Philadelphia. George William Childs, whose name was lent to this company, was apparently more known as the publisher of a newspaper called the Philadelphia Public Ledger. Today, Loyola’s copy has some sort of adhesive tape holding its spine together, but I did not fear for its safety upon opening it as I did with the Stearns book. The book was another author’s attempt to give his own explications of Constitutional, as well as other local and state, laws for students. The language, however, is not as simplistic as some of the self-help books or common school books, and the subtitle on the title page tells us why. It is specifically addressed as being “designed chiefly for the use of those in schools, academies, and colleges.” Finally, we have a piece of legal analysis intended for college students. 1855 was a good year for such a book to come out: Joseph Story had died ten years previously and his ideas on legal education were beginning to gain traction. Which must bring us, in conclusion, to the man himself. Modern American legal history began at Harvard in the nineteenth century. There in 1870 (as explained in one of my earliest posts) Christopher Columbus Langdell instituted his ‘case method’ of legal education which has become the standard model for law schools in this country to this day. But Harvard had already been at the forefront of legal education and innovation for decades before this. Harvard’s law department struggled from its founding in 1817 until 1827 when alumnus Nathan Dane endowed a law professorship on condition it be given to Supreme Court Justice Joseph Story. Story undertook strengthening the department, believing in the need for an elite law college in the United States. Wielding influence already as a long-serving and outspoken member of the highest Court in the land, he set out to leave his mark on the country’s legal landscape. In addition to writing textbooks, he also composed more opinions for the Marshall Court than anyone but the Chief Justice himself. Joseph Story was a very popular author during his lifetime, as well as an influential judge and educator. (According to his Wikipedia page, he made almost double in publishing proceeds than his Supreme Court salary.) Judging by the number of digital surrogates, as well as the continued availability of modern editions, his Familiar Exposition of the Constitution of the United States, first published in 1840, was one of his most popular books. St Ignatius’s original library catalog lists an 1858 edition published by Harper Brothers in New York. Though the college’s original edition no longer appears to exist, the text was popular enough for the school to replace it. In fact, one of these replacement copies, by the same publisher and printed two years later, is close enough to the original that one can get an idea of what it was like. Still in circulation, I confess that I originally was convinced that this 1860 edition in fact was the original, and that the catalog simply had an error in years. This theory died when it was pointed out to me by Dr. Roberts that, unlike the other originals still extant, this copy does not have a stamp for St Ignatius College on the inside. This copy does in fact have not one, but two markings from pre-Loyola owners: one was JD Madden who, as his stamp says, gifted the book to the school, and an older owner, whose name is illegible but seemingly owned it in San Jose in 1860. The contents of Story’s Familiar Exposition themselves are, as is conveniently done in many of these old books, explained on the title page. This is an exposition “containing a brief commentary on every clause, explaining the true nature, reasons, and objects thereof; designed for the use of school libraries and general readers with an appendix containing important public documents, illustrative of the Constitution.” On its face, its content does not seem to differ from many of the other books on this list. It includes the Constitution, some other documents such as the Declaration of Independence, and the author’s opinions and commentaries on it. Particularly interesting is Story’s own commentary. There is nothing brief about it. He proceeds to explain the entire history of the colonies and the Revolution in the chapters leading up to Constitution. Then, the reader is given a unique insight, not just into the laws of the land, but into the mind of one of the men who was involved in the official interpretations of many of them in the nation’s highest court. This is essential reading for any law student interested in “original intent”, as well as a fantastic tool for a student of American government. If a reader only had time to read one book of American Constitutional exposition, this is the one to read. The original St Ignatius collection, with copies of the Magna Carta older than the Virginia colony, reprints just as old of Roman legal codes from the sixth century, and the seminal work of Justice Story, among many others, is a perfect place for one to see just how old the study and practice of the law truly are. The history of the law is indeed the history of civilization and I’m glad I had the chance to study it through the lens of Loyola’s original library catalog. Every Man His Own Lawyer? Erik Berner returns with his penultimate post on his research into the Secular Legislation section of the St. Ignatius College Library, this time on early legal self-help books in the collection. As Erik puts the finishing touches on his final post for next week, he is also packing up to move across the country for the next stage in his intellectual journey: as a student in UCLA’s law school next fall. Way to go, Erik! Frank Crosby, Everybody’s Lawyer and counsellor in business. (Philadelphia: 1859, Potter). Frank Crosby, Everybody’s Lawyer and book of forms. (Philadelphia: 1860, Potter). Theophilus Parsons, The Laws of Business for men in all states of the Union. (Boston: 1869, Little, Brown & Co). Alexis de Tocqueville, Democracy in America (Cambridge: 1863, Sever & Francis). John G. Wells, Every Man his Own Lawyer and United States form book (New York: 1859, self). The introduction to Frank Crosby’s Everybody’s Lawyer and Counsellor in Business explaining his intended audience. As I have established in my posts over the year, there did not seem to be any intention, at least at the founding of St Ignatius, of educating future lawyers at the school. Though there were still many reasons that a knowledge of the law would be useful for the Jesuit priests and their students, for many of them, the dry and legalistic nature of a no-frills set of statutes or legislation rendered many of the previously discussed books incomprehensible. To somebody seeking only a functional knowledge of the law, explication was required. Writers and publishers were aware of this and a thriving culture of published legal commentary existed. These books were essential for a range of lay audience, such as a Jesuit seeking knowledge about property restrictions or an entrepreneur-in-training who would like to understand the legal parameters within which he must do business. Of the five books in this category, only one — perhaps the most unique and interesting one – still survives and, in fact, is in good enough condition to still be in general circulation at the library. Title page from Google Books copy of Crosby’s 1859 edition of Everybody’s Lawyer and Counsellor in Business. St Ignatius’s original collection contained two copies of Frank Crosby’s Everybody’s Lawyer. Though neither exist anymore, the catalog contains information about their publication. Both editions were printed in Philadelphia by a publisher named John E. Potter. The first edition is called, in full, Everybody’s lawyer and counsellor in business : containing plain and simple instructions to all classes for transacting their business according to law, with legal forms for drawing the various necessary papers connected therewith (1859). Fortunately for us a digitized version is available on Google Books. Though I was unable to glean from my research much about the writer or original publication of the book, I was able to gain a basic idea of the book’s contents through the digital surrogate. The book seems to offer, as the subtitle suggests, “plain and simple instructions” on the application of the various laws of the American states to business transactions. Indeed, this seems to be intended more for the “common business man.” This was, after all, the era of land-grant universities, when education and business acumen were becoming more easily accessible. Unfortunately, it is tough to conjecture on the differences of the second, 1860 edition: Everybody’s lawyer and book of forms : containing the laws of all the states … with plain and simple instructions to everybody for transacting their business according to law : the legal forms required for drawing up the various necessary papers : and useful information in regard to the government of the United States, and the various state governments, etc. etc.” I could not find a digital surrogate or background information on this edition. Title Page to Parsons’ The Laws of Business from a copy in Google Books. Theophilus Parsons’ The Laws of Business for Men in all States of the Union (1869) is a self-reference book, containing explications of commercial law specifically intended, as indicated in the introduction, for the mercantile community. Parsons is an interesting figure in the history of legal education. Joseph Story, whose own work will be analyzed later, is credited with instituting the first modern law program at Harvard around 1876. As Dane Professor of Law from 1848-1870, Parsons embodies, better than any other perhaps, the phase before Story’s more modern era of legal education. Though Loyola’s copy no longer exists, the same 1869 edition printed in Boston by Little, Brown, & Co. has been digitized on Google books. Parsons’ introduction gives us an insight into his changing views on legal education. Writing in an era when elite apprenticeships were the main avenue for the training of barristers (Parsons even confesses that the work started out as a volume intended for the reference of lawyers), he shares his personal view on the need for an expansion of common knowledge of law. He certainly believed that it was in the best interest of businessmen to understand the laws within which they must operate. The Laws of Business is an attempt to explain the legalese of business regulations in a way that a reasonably-educated person could understand, rather than simply reprinting the statutes. Reading almost like a textbook, it is a useful commentary even beginning with some basics on law itself (such as the difference between civil vs. common law). It is understandable that the Jesuits would want a book like this in their collection, and it is not surprising that this one specifically was chosen. Parsons wrote many volumes of popular legal commentary which were among the most successful in the genre, particularly (according to his commentaries on maritime law. Could John Wells have placed any more text on the title page to his 1860 edition of Every Man his Own Lawyer? The last of the so-called “self-help” commentaries, also no longer held by Loyola, is an 1859 edition of John G Wells’ Every man his own lawyer, and United States form book: being a complete guide in all matters of law and business negotiations. Wells published the work himself in New York. Had it not been for Wells’ analysis and commentary, this book could have been considered for the category of straightforward statutes; it contains copies of many of the forms and laws necessary for an entrepreneurial businessman. Wells explains what he felt these were helpful for those wishing to represent themselves in the burgeoning world of capital. A digital copy of an 1860 edition, also printed in New York by the author, is available on the . I referenced it in the hopes that it is not too different from the previous year’s edition, which the publisher notes was destroyed by a fire (p.10). Like the Crosby and Wells books, this does not seem intended explicitly for academia, but it does seem useful for the types of students St Ignatius was looking to enroll at the onset of their legal program. Specifically, the self-starter nature and simple writing style of Wells’ book, much like Crosby’s, would be easy for working immigrants to study largely on their own. Unfortunately, it is hard to find any real information about Wells. The titles of a few of his other books indicate that the bulk of his publishing ventures were in this patriotic, educational mold. (If the existence of digitized copies is an indication of popularity, Wells’ publication of a New Map of the United States was more popular than his Every Man His Own Lawyer). While the previous three commentaries were expressly intended for self-reference by educated men intending to make their way in the business world, the last work is more philosophic in nature. Fantastic former ownership stamp on surviving copy of de Toqueville’s Democracy in America in Loyola’s collection today. Perhaps the most popular commentary the Jesuits owned, the original copy of which is still in Loyola’s collection, was an 1863 edition of Alex de Tocqueville’s Democracy in America. Many people know this book, or have heard of it (it is assigned as essential reading in many Political Science classes to this day) but do not know the unique story of how de Tocqueville came to write it. Democracy was his attempt to use observations he made about American society while traveling through the United States as a springboard for his philosophizing on the idea of democracy: why it had worked in America and why it had not worked in other parts of the world. The work was written in the 1830s; memory of the aftermath of the French Revolution was in De Tocqueville’s mind. He was not sent to America by the King of France to write this work however; he was actually a part of an expedition sent to study the United States prison system. He simply took advantage of his circumstances to work on something much larger than his actual assignment. Titlepage of the surviving copy of Democracy in America in Loyola’s collection. De Tocqueville seems, like many European commentators of the time, to be skeptical of democracy, particularly of empowering the masses. He takes a libertarian approach, cautioning against what he called the possibility of ‘soft despotism’ (strangulation by too much government regulation) and believed the character of the American people was the only thing stopping this sort of thing from happening. De Tocqueville did, however, take a decidedly progressive view when it came to race in the United States. His partner on the expedition, Gustave de Beaumont, wrote his own piece of social commentary based on the trip, a book called Marie critiquing American slavery and racial segregation. De Tocqueville agreed this was one of the most damning faults of American democracy, even going so far as to predict the Civil War that came decades later. Loyola’s 1863 edition is in very good condition and still held in general circulation at the University’s library. It was printed in Cambridge, Massachusetts by Sever and Francis, a publisher about whom little information is available online besides a small list of books printed by them available on the , as well as a smaller list on Open Books. At first, I wondered if perhaps this publisher was connected to the still extant English publisher Taylor & Francis, but this does not seem to be the case (and, in fact, judging by some of the earliest publication dates on the Open Books list, Sever & Francis seem to have been publishing in the United States before Taylor & Francis were in Britain). Evidently they printed mostly philosophical and academic texts, such as books on Greek Logic and American political treatises. 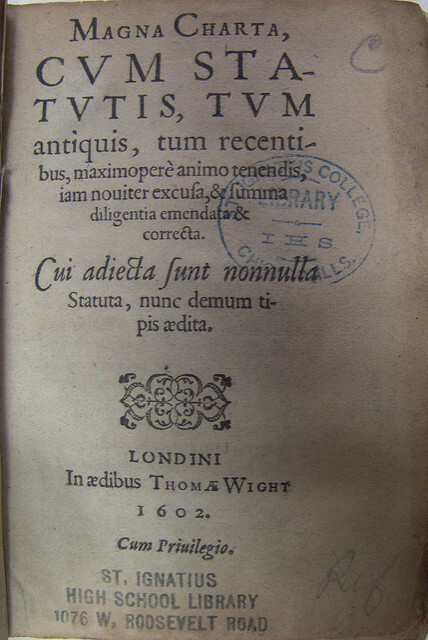 Additionally, the Loyola copy has a stamp in it indicating its ownership at some point by a “Rev. Dr. Lightner”, though Google was unable to crack the code of the identity of this donor. De Tocqueville’s audience was educated lay people, but its inclusion in an academic library is understandable. By the time the Jesuits created their collection at St. Ignatius, the work was already quite popular in both Europe and the United States. It served as a useful piece of political philosophy as well as a valuable outsider’s perspective on the history of American politics. For a modern reader, the book can become an intense intellectual exercise in deciding whether the modern United States would disappoint de Tocqueville, impress him more than this country did during his lifetime, or leave much the same impression. Such speculation could fill volumes of scholarly journals but there is no space for it in this blog. One who finds such things intriguing would be well served to seek this book out at the library; you may even find the library’s original copy! and he even remembered the ladies, sort of. What Books Were Popular Among Catholics in 1849? Dan Snow wraps up his internship working on the Jesuit book trade ledger with this post on the titles that the Jesuits most frequently purchased from East Coast and European publishers/wholesalers between May and September 1849. Dan graduated last week an MA in History. We wish him well on the next stage in his intellectual journey! 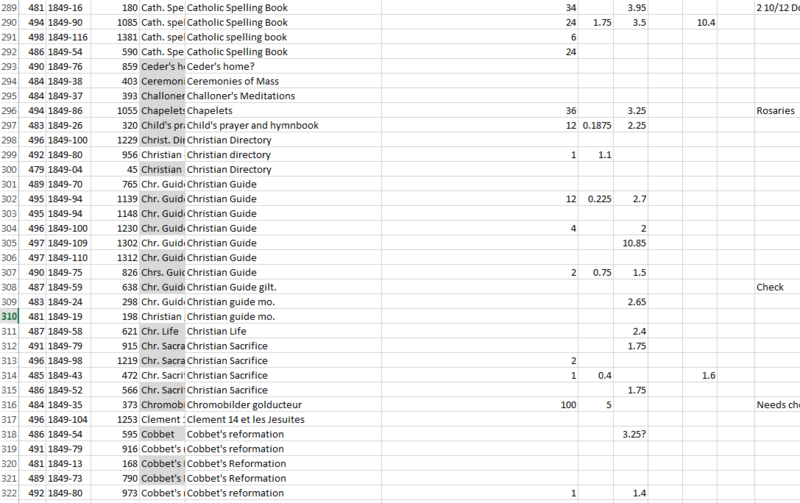 During the last half of the spring semester, I transcribed the items imported by the Jesuits from East Coast and European publishers between October 1848 until September 1849. Earlier in the semester I transcribed the items that were sold by the Jesuits from May through September 1849. With this data in Excel spreadsheets, the accounts of the Society of Jesus can be explored in a more convenient manner. This information allows us to begin looking at the specific books and items involved in these transactions. Taking the titles we have now, we can begin to research their publishing information, content, authors, and other relevant data. Finding out more about the specific books the Jesuits bought and sold can help us think about how these books were used in contemporary Catholic culture. Of the nearly 1,300 items listed in the 1849 exports, 354 were unique items. This means that the 1,291 transcribed listings were made up of only 354 distinct items (such as a Catechism). Of these 354 items, 185 were listed only once, accounting for 52. percent of all the individual titles. Only 14.7 percent of the unique items sold more than five times. Thus a relatively small number of items (52 out of 354) were among the most popular items sold by the Jesuits. Removed non-textual objects and unidentifiable books reduces the list of most popular works even more. There are a number of devotional objects that the Jesuits sold. As I noted in my last post, “beads” could refer to various items. Crosses, medals, beads – these items require more extensive research of a different sort than the books in the ledger. I also did not try to research shortened titles which I felt were too general to be able to identify with confidence. Titles like “Gospels,” “Bible,” and “Catechism” are too vague to determine with exact certainty. It is likely that there was a popular, standardized Catholic version in use of each of these texts, but the presence of such a popular version of the Gospels would not necessarily mean that the Gospels listed in the ledger were that version. After removing these items, I was left with 30 titles from the original 52 items. I took the shortened titles used in the ledger and tried to research the full title, author, publisher (by taking the title and checking the import records from October 1848 through September 1849), and purchasers (using my earlier research). Primarily using WorldCat for these searches, I hoped to establish some preliminary knowledge on what these 30 titles were. The 3rd Reader was likely The Third Book of Reading Lessons. This textbook was part of a series popular among Catholics at the time. (The “1st Reader” and “2nd Reader” were also commonly sold in the ledger.) The Third Book of Reading Lessons was originally published by the order of the Brothers of the Christian Schools (the De La Salle Brothers, or the Frères des écoles chrétiennes, using the post-nominal F.S.C.). Fielding Lucas and Eugene Cummiskey both sold the textbook to the Jesuits between October 1848 and September 1849, and the book was also sold by other publishers (as this 1852 Edward Dunigan version shows). The Christian Brothers did have a presence in St. Louis and placed at least two orders with Jesuits in 1849. However, they never bought their own book. Instead, The Third Book of Reading Lessons was sold to Rev. Druyts, Rev. Schoenmakers, Rev. Burke, and the Sisters of the Visitation. All four worked in education: Rev. J. B. Druyts, S.J. was the Vice President of the Board of Trustees at St. Louis University; Rev. John Schoenmakers worked at a Jesuit mission in Osage County, Kansas; Rev. Thomas Burke, C.M. 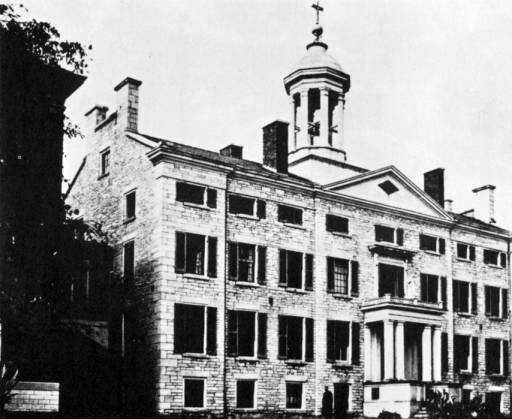 was the procurator at the Vincentian St. Mary’s Seminary in Perry Co., Missouri; and the Sisters of the Visitation had a convent and school in St. Louis. The “3rd Reader” was used in Catholic education throughout the Mississippi Valley and beyond during the mid-century. It was a useful text in a broad variety of environments. Benzigers’ 1878 Der Monat Maria. By 1878, Benziger had established itself in New York, Cincinnati, and St. Louis while in 1849 the Jesuits still ordered from Einsiedeln, Switzerland. The “Monat Maria” or Der Monat Mariä oder fromme Übungen zur Verehrung der göttlichen Mutter auf alle Tage des Monats Mai (The Month of Mary or Pious Exercises for the Worship of the Divine Mother on All the Days of May) was used with a specific population: the rising numbers of German immigrants to the Mississippi and Missouri valleys in the 1840s and 1850s. This devotional manual was published under a variety of authors, editors, and publishers throughout the nineteenth century. The Switzerland-based Benziger brothers sold the “Monat Maria” in the late 1840s (and were still publishing it in 1878). It is likely that the Jesuits sold the version created by Francis Xavier Weninger, S.J. (1805-1888), an Austrian Jesuit who came to the U.S. after the 1848 revolutions. The Jesuits sold the “Monat Maria” to several priests, including: Rev. William Wheeler at St. Patrick’s Parish in St. Louis; Rev. Schoenmakers, Rev. Arnold Damen, S.J. at Francis Xavier Parish, St. Louis; Rev. Joseph Melcher, the Vicar General of the Archdiocese of St. Louis; and Rev. Florian Sautois, S.J., also at Francis Xavier with Damen. The devotional manual would have proven useful to parish priests looking to support the devotional lives of German immigrants, providing them with a familiar language in their adopted country. The “3rd Reader” and “Monat Maria” were at the low end of the appearance spectrum for 1849 exports. The “Ursuline Manual” and “St. Vincent’s Manual” were at the top with 32 and 30 listings, respectively. The Jesuits bought copies of St. Vincent’s Manual: Containing a Selection of Prayers and Devotional Exercises, Originally Prepared for use of the Sisters of Charity in the United States of America from both John Murphy and Fielding Lucas in 1849. In fact, as Murphy’s 1848 edition notes, the manual was “sold by all the principal Catholic Booksellers throughout the United States.” In turn, the Jesuits sold the Manual to 22 different individual purchasers in 1849. The “Ursuline Manual” enjoyed a similarly wide range of purchasers. The Ursuline Manual: or, A Collection of Prayers, Spiritual Exercises … was written by the Ursuline Sisters in Ireland as a devotional manual “for forming youth to the practice of solid piety.” It was a popular work, like St. Vincent’s Manual, and published by multiple firms. The Jesuits purchased copies from Edward Dunigan, Fielding Lucas, and John Murphy. They sold the Ursuline Manual to 20 different individuals, ranging from lay persons to Jesuit professors. These devotional manuals were highly adaptable books that could be used by a variety of Catholic audiences. All found them a helpful guide to the Catholic Mass, celebrated in Latin. The laity could use them for fraternal organizations or within their own homes. Parish priests could use them within their schools, as could the educators at convents or seminaries. The books would have been helpful for creating a sense of Catholic identity, providing a set of prayers and customs to be carried out in a systematic way. When a priest was not readily available – which was the case for many new parishes which shared a priest with nearby congregations – the books could provide faith instruction outside the walls of the church. The institutional Church backed the publication of these devotional manuals, as Dunigan’s 1857 version of The Ursuline Manual shows approval from the powerful Archbishop John Hughes of New York. 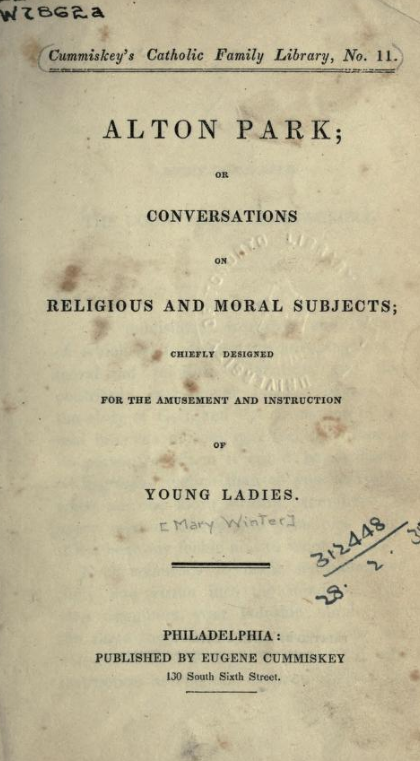 All of these reasons likely helped the Ursuline Manual and St. Vincent’s Manual become two of the most popular works in 1849. In closing, there is still much more work to be done on the books and devotional objects sold in 1849. These examples are just four of more than 350 items that can be researched and contextualized within nineteenth-century American Catholicism. Each can offer some insight on Catholic culture and society of the time. Moreover, each book has a place within this world. The overall story of this market; of this trade; and of the books, institutions, and people who made it work speaks to the nature of Catholicism and the American frontier at mid-century. I have been happy to play a small role in this project and hope that some of the work I have done will be useful for my fellow (and future) project members. The Jesuit Libraries Provenance Project has and will continue to offer a fascinating look at the power of books within faith and community. Erik Berner returns with the first of his last three posts on the Secular Legislation section of the original St. Ignatius College library collection. These posts address the largest segment of the collection, work on United States law. The most extensive part of the secular law collection is works related to the laws of the United States. Keeping in mind that the United States had been independent for a full century by the time the library was begun, it was likely important to have a good collection of the laws of the land. The works related to United States law in the catalog can be broken down into three categories. First, there are five compilations of important American legal documents with little or no commentary. These include three containing such important documents as the Constitution and Declaration of Independence and two collections of legal opinions issued annually. Second, there are five books of instructional or referential commentary intended for the use, primarily, of law students in apprenticeship programs or businessmen. Third, there are five books rich in commentary and expressly intended for education, providing a fitting endpoint to my analysis of the Jesuits’ intentions for legal education. The American’s guide: comprising the Declaration of Independence; the Articles of Confederation; the Constitution of the United States, and the constitutions of the several states composing the Union. Viz. Maine, Massachusetts, New Hampshire, Vermont, Rhode Island, Connecticut, New York, New Jersey, Pennsylvania, Delaware, Maryland, Virginia, North Carolina, South Carolina, Georgia, Kentucky, Tennessee, Ohio, Indiana, Louisiana, Mississippi, Illinois, Alabama, Missouri. (Philadelphia: 1835, Hogan & Thompson). Digest of the published opinions of the Attorneys-General and of the leading decisions of the Federal courts, with reference to international law, treaties, and kindred subjects. (Washington: 1877, Govt Print Office). The United States Patent Law: Instructions how to obtain letters patent for new inventions. (New York: 1875, Munn & Co). William Hickey, The Constitution of the United States, the Declaration of Independence, the Articles of Confederation, the prominent political acts of George Washington, electoral votes for all the presidents and vice-president, the high authorities and civil officers of government, from March 4, 1789, to March 3, 1847, chronological narrative of the several states and other interesting matter, with a description account of the state papers, public documents and other sources of political and statistical information at the seat of government. (Philadelphia: 1853, TK &PG Collins). Erastus Buck Treat, National political manual, comprising facts and figures, historical, statistical, documentary, political, from the formation of the government to the present time. With a full chronology of the rebellion. From official and other sources. (New York: 1872, EB Treat). at the seat of government. Fortunately, the 1853 edition printed in Philadelphia by TK and PG Collins listed in the St. Ignatius College catalog has been digitized by the Internet Archive. This over 300-page volume functions as an “everything you need to know in one book” reference source for a common American. This work could conceivably have been intended for scholarly use, but it would make just as much sense if it was for personal reference. It is not surprising that the compilers of the library found this a useful volume, though many of the documents inside are also included, with more detailed commentary, in other publications in the collection. A similar compilation listed in the catalog still survives in Loyola’s collection today. The title once again proudly lists the broad scope of its contents: The American’s guide : comprising the Declaration of Independence; the Articles of Confederation; the Constitution of the United States, and the constitutions of the several states composing the Union. Viz. Maine, Massachusetts, New Hampshire, Vermont, Rhode Island, Connecticut, New York, New Jersey, Pennsylvania, Delaware, Maryland, Virginia, North Carolina, South Carolina, Georgia, Kentucky, Tennessee, Ohio, Indiana, Louisiana, Mississippi, Illinois, Alabama, Missouri. The 1835 edition of the American’s Guide was printed in Philadelphia by Hogan and Thompson. It contains no fluff of any sort: no commentaries are inserted between the assembled documents, making it a reference source that any library would find useful to hold. An 1849 edition held by Loyola of The American’s Guide at Loyola contains an ex libris from Rev. Dr. Eneas B Goodwin. Initial internet research does not turn up much detail about him, but I would guess he was a prominent priest in the Chicago Archdiocese; the two references to him easily found through a web search are about his role commuting from Chicago to Downers Grove to assist in the establishment of St. Joseph Parish there in 1906, and a wikisource reference attributing some contributions to the 1913 Catholic Encyclopedia to him. It seems likely that if he was not a Jesuit or involved with St. Ignatius himself, he was a sympathetic priest in the Archdiocese who wanted to give a gift to a new Catholic institution in his city. Erastus Buck Treat’s 1872 New York edition of The National Political Manual, though no longer held at Loyola, has been digitized by the Internet Archive. Of the five books of laws, this one offers the most context about its purpose, despite (excluding a two-page introduction) being a straightforward collection of legal documents. It offers a wider array of documents, including statutes like the Dred Scott decision, the Monroe Doctrine, speeches such as Lincoln’s inaugural address, and statistics such as voting results for presidential elections, in addition to the standard Declaration of Independence and Constitution. The purpose, judging by its year, of the patriotic rhetoric of the introduction, and the choices of documents, must have been to promote unity in the post-Civil War (or “post-Rebellion” as the editor tellingly terms the long conflict) United States. Beyond this, it is hard to speculate who the editor imagined using it specifically, whether students, politicians, lawyers, or “common men”. Still, it is interesting to see the subtle propaganda in the editor’s “appeals to the patriotic sensibilities of all classes of readers” as he claims he will make in the introduction. This, despite its political hinting, may have been the most useful of the compilations with its diverse collection. A copy from the Internet Archive of the National Political Manual. Munn and Co.’s United States Patent Law (1875) lists, in their original legislative language, American laws and statutes pertaining to the obtaining and holding of patents. The publisher Munn and Co. was run by Orson Desaix Munn I and had its origin as a patent office, so it is not a surprise that it would print patents or laws about them. The publisher is most famous, however, for publishing the still-extant journal Scientific American. Neither the original copy of the work nor a digital surrogate can now be found. This would seem like a perfect edition to the type of workingperson-targeted part-time legal education that Loyola’s law school began providing to Chicago immigrants in the early 20th century, but its inclusion in the Jesuits’ collection is more of a mystery. Interesting research can be found elsewhere on the manner in which the Midwest Jesuits acquired whatever books they could get their hands on, and this may well have been something that was added simply because it was available. The Loyola Jesuits throughout their history have abstained from any manufacturing or publishing ventures, despite a Loyola Press in Chicago run by unaffiliated Jesuits, so it is unlikely that they had sought this book out for business purposes. The Digest of the published opinions of the Attorneys-General, and of the leading decisions of the Federal courts, with reference to international law, treaties, and kindred subjects (1877) was included in the 2014 exhibition Crossings and Dwellings, at the Loyola University Museum of Art (LUMA), but has since disappeared. This is an important reminder of the threat to these nineteenth-century books. Besides the obvious threats to their physical condition imposed upon books still in circulation by the rigors of serving Loyola’s reading public, even those that have been removed for their historical value can still be lost in the shuffle. The Jesuit’s edition of this digest was published by the government printing office and seems to have contained rulings issues by attorney general each year. A web search corroborates its continued publication, under various guises, every year. It is doubtful that the St Ignatius founders envisioned their institutions operation within a globalized educational sphere (which the modern Loyola has fully embraced), so this, like the Patent Law collection, was very likely obtained simply because it was available. Erik Berner turns this week to some surprising pre-Revolutionary War law books in the collection of the St. Ignatius College Library. Charter Granted by Their Majesties King William and Queen Mary to the Inhabitants of the Province of the Massachusetts-Bay in New England (Boston: 1726, B. Green). Samuel Peters, Blue Laws of New Haven Colony (Hartford: 1838, Case). The remaining eighteen books in the secular legislation section all deal ostensibly with American law. It is not surprising that most of the books in this section were American titles. The late nineteenth century was a time when education, particularly the type offered at St. Ignatius College, was largely an effort to help assimilate and “Americanize” the poor and immigrants into “civilized” American life. As I discovered in my research on the development of legal education, the law was mostly a local practice at this time. If a young man had higher legal ambitions, he would hope to become a part of the Washington legal community or a politician; international law was not often practiced outside of politics. It was difficult to juggle so many titles while doing research, so I broke them into rough categories which has shaped how I organize my remaining posts. My categorization encompasses: pre-revolutionary (or colonial) law, laws and statutes (the actual text of post-revolutionary law), reference and commentary (interpretation and explication of the law), and, lastly, books expressly intended for academic purposes. In this post, I start with the earliest American law books on the college library shelves. The copy of the 1726 Charter survives in Loyola’s Special Collections today. There are two titles that address colonial law in British North America before the American Revolution. The first is a Charter Granted by Their Majesties King William and Queen Mary to the Inhabitants of the Province of the Massachusetts-Bay in New England (1726). The other is the Blue Laws of New Haven Colony (1838) by Samuel Peters. The latter is a difficult book, as will be discussed, consisting not of real laws, but fake ones. The Charter is short, simply granting the colonists of Massachusetts Bay the right to form a colony, and is bound with the much longer Acts and Bylaws of the colony. Published in 1726 in Boston, the purpose or audience of the book is hard to glean. Though at first it was my guess that the two texts were bound together by the librarians at St Ignatius College (or their Loyola successors) after acquisition, similar printings of the Charter, in digital surrogate, suggest that the Acts and Bylaws may have been bound together with the Charter from the start. At any rate, the two that I have viewed bound them together and the connection makes sense; why not have all your official documents pertaining to the laws of the Massachusetts Bay Colony bound together in one handy volume? Signature of a previous owner of the 1726 Charter. The Acts and Bylaws contains an almost obsessively detailed table of contents which one can easily reference any number of legal topics, leading me to conjecture that it may have been used for the sort of legal education common at the time or for individual reference. It seems that this is useful for its historicity and common law precedent to later US law, and one can see why it would be kept by the Jesuits. The Massachusetts Bay Colony was, after all, one of the earliest permanent European settlements in the present United States and its elaborate statutes and cases still serve as common law foundation for the country’s laws today. (This particular colony could, perhaps, be of even more specific interest to religious scholars for its associations with religious courts, and witchcraft persecution, but I cannot say whether the founding Jesuits of St Ignatius found such topics as intriguing as I do). A curious work of fake colonial laws. Though no longer held in Loyola’s collection, a copy of the 1838 edition of the Blue Laws of New Haven Colony is available as a digital surrogate on the Internet Archive. This edition was printed by Case, Tiffany and Co. in Hartford, Connecticut. (An internet search turns up little about the publishing house, besides it being founded in Hartford sometime in the 1840’s and having its beginnings in printing mail-order Bibles.) The digital edition, in tandem with background information from my research, almost caused me to move the book to a different category. In reality, it was not a book of colonial law at all, but was written as propaganda in England. Yet I ultimately included it in the colonial category for its subject matter and because it, apparently, was long confused with a real book of law on the Continent and in England. I originally expected the Blue Laws to be simply a codex of law, or a charter like that granted to the Massachusetts Bay colonists. I was quite wrong. This is actually a work of fictional law created by an Anglican priest named Samuel Peters in London in 1781. Peters had been expelled from the Connecticut Colony for his opposition to the American Revolution and chose to write a scathing diatribe against the “backwards colonials” and their strange sectarian Protestantism. The pamphlet claims to lay down the barbaric and religiously austere laws of the Colonists to shock a Loyal Tory readership. According to Peters, colonists basically must follow a strictly Puritan guideline for life, or risk banishment, imprisonment, fines, or execution. Adultery merited execution, and priests of different sects of Christianity were to be banished or imprisoned. These guidelines go right down to the stipulation that all men must have their hair cut around a cap! It is quite entertaining reading, to be completely honest, but I cannot imagine what use it held for the Jesuits. (I pray that this use was not as a basis for constructing their own disciplinary codes…) It is conceivable, given that my research has indicated that this was sometimes confused with real law in Europe, that the European-born Jesuits might have been misled, but it is probably just as likely that they were aware of the nature of the text and kept it for other purposes. The following is the next installment in Dan Snow’s exploration of the data from 1849 in the Jesuit book trade ledger he has been studying with Bianca Barcenas and Kyle Roberts over the past academic year. Here he shares some preliminary results from transcribing the sakes data. Since January, I have been examining the orders that appear over the course of a five-month period (May-September 1849) in the book trade ledger held in the St. Louis University Archives that we’ve been working on over the past year. 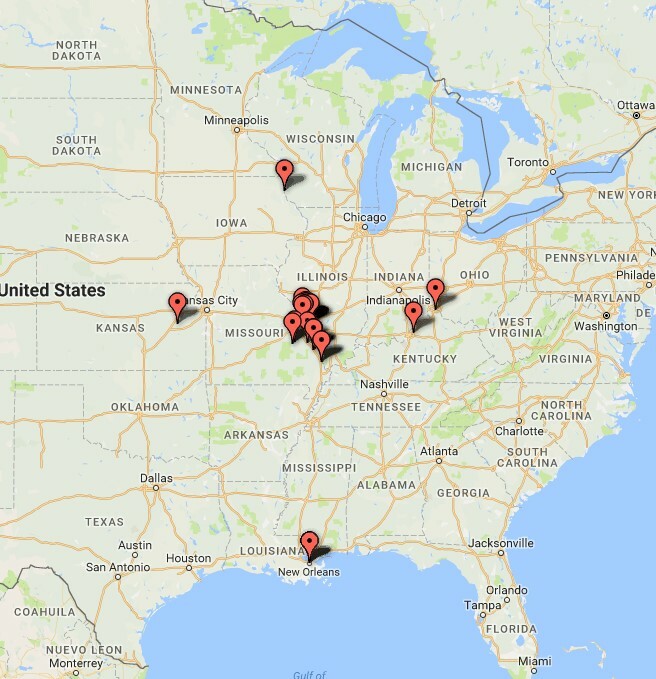 Last week, I finished transcribing the orders made by various priests, institutions, and lay persons throughout the Mississippi Valley. In total, there were 119 orders over this period. I created a spreadsheet to capture this data. On each new line I recorded each item – books, medals, beads, pictures – listed as sold, along with (if listed) its quantity and price. For example, the order on the top of page 472 begins with Rev. Father Siegrist purchasing “20 Gebetbuch 1 doz. Crosses” (Gebetbuch is German for “prayer book”). To represent this I made two lines on my spreadsheet, the first for Gebetbuch and the second for the crosses. After my first pass, the total number of items listed across all the transactions is 1,394. (This number could change pending review.) That is not to say only 1,394 items were bought – a purchaser may have bought one copy of “True Piety” but eight copies of “Key to Heaven.” A future stage of my work will involve calculating, as best as I can (with the incomplete information recorded), the quantity of items sold. 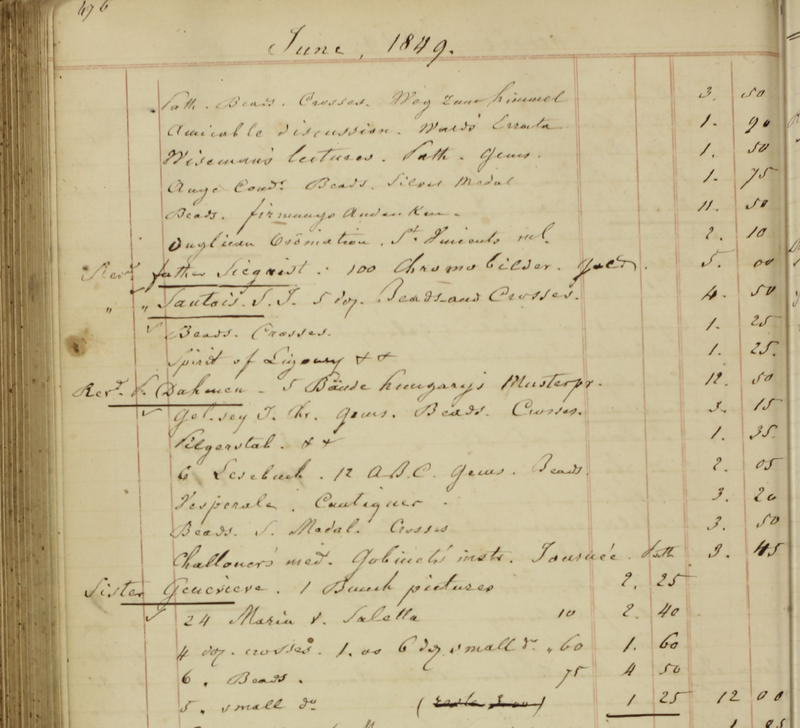 A page from Dan’s spreadsheet showing some of the information he gathered about each item in the part of the ledger he analyzed, including a standardized name, quantity, and cost. Doubtless few people count transcribing among their favorite activities and the repetitiveness of the task doesn’t do much to elicit enjoyment. That being said, I did find the past few weeks of transcribing to be useful. When I first looked over the nineteenth-century handwriting I set out to transcribe, I felt a bit anxious. I’ve never been great at reading handwriting and the ledger seemed to be an insurmountable challenge. The first week was difficult: I misread titles, struggled to decipher each line, and skipped countless works. I’m a bit ashamed to admit that I did not realize at first that each line usually held more than one title. With that breakthrough, the amount of work ahead of me increased but I began to develop a greater understanding of what I was looking at. I became much more familiar with the handwriting I was seeing – though certain letters still held me up – and with the titles listed. I could start to recognize the various shorthand abbreviations for “catechism” and could pick out German works with greater accuracy. Over the course of the process, the amount of time I was spending transcribing each line dropped dramatically and my accuracy improved. Abbreviations continued to complicate the matter as often times the ledger’s author listed titles in shorthand by writing “Gel. Sey J. C.” for a work like Gelobt Sei Jesus Christus. For many works, these abbreviations can be easily tied to their full title. For works abbreviated as “Cath. Chr.”, one may encounter many books which began with “Catholic Christian.” These abbreviated titles then complicate our understanding of the market. There were still many items that I could not recognize and there were still plenty of errors, but the vast majority I was able to transcribe with a high degree of certainty. (About 1,291 of the 1,394 have been transcribed with great confidence.) I struggled with fitting the non-standard format of the ledger into a spreadsheet that would accurately represent a series of abbreviations and a numbers system that was incomplete at best. I still need to make some alterations to my system of recording, but it is a gratifying experience to look back over the hundreds of items I have transcribed and be confident in what I had written. Nonetheless, a simple transcription was never the end goal of my work this semester and I am happy to be moving on to the next step. Now that nearly all of the titles in the orders have been transcribed, I can begin analyzing what was bought. The first thing I need to do is make a list of unique items. As I mentioned, there are repetitions of different works among the 1,394 listings. For example, Alton Park, a didactic novel by Mary Winter, appears three times on my spreadsheet: in transactions 50, 63, and 80. In my new spreadsheet, I will list Alton Park only once, but will also note that it was listed in three transactions, that it sold at least three copies, and that it was listed as costing $1.50 in one of those transactions. By doing the same for the rest of the listings, I’ll be able to know just how extensive the Jesuit offerings were, but also be able to calculate what were the most frequently purchased items. In terms of frequency, the most commonly appearing item (again, not counting the number sold but frequency of purchase) was not a book: 87 times over five months “beads” appeared in the ledger (91 counting “small beads” and “crosses and beads”). Beads could refer to a number of things and the term was likely used as an umbrella term for rosaries and other devotional elements. Beads could also be ordered in large quantities; while the vast majority do not have a listed quantity, the ones that do vary from 12 up to 72. After beads comes another non-literary item: medals. Medals could represent a number of things ranging from small pendants of the Madonna and child to various saintly images reproduced for communions or confirmations. Medals were divided into three categories, including “medals” (21), “gold medals” (22), and “silver medals” (28), along with two “silver and gold medal” orders. Medals frequently varied in the amount ordered: again, many had no listed quantity, but could number under ten or in the dozens. The third most common item was a German prayer book entitled Gelobt Sei Jesus Christus which appeared 35 times. That a German work would appear so frequently reflects a broader demand for German books within the ledger. While the majority of books were predominantly English, German works were not uncommon (out of the 353 unique titles, 45 were German works). French works were also common, but less so than German books. The most frequently appearing French work was “Ange Conducteur” – Jacques Coret’s L’ange conducteur dans la dévotion chrétienne – at 12 appearances. 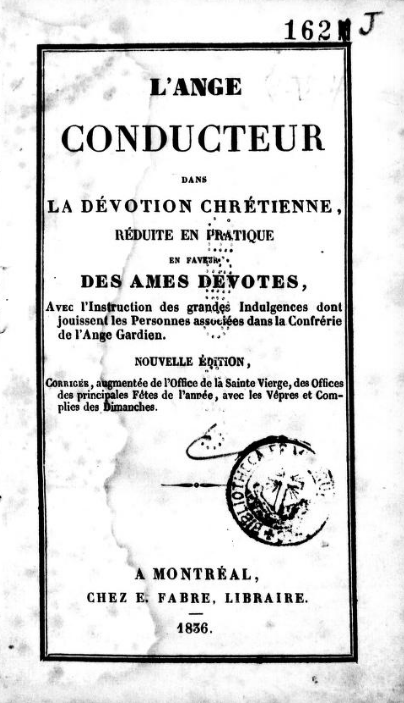 Coret, a Belgian Jesuit, first published L’ange conducteur as a devotional prayer book in 1681 in Paris. It would be reprinted numerous times throughout the Catholic world in the next century and a half, with an 1836 edition being published in Montreal. This is a work that would have appealed to French-speaking clergy, students, and laity. Yet German settlement was rising at a much faster rate than French. During the 1840s and into the 1850s, German settlement in Missouri and in the United States generally was on the rise, and this fact is reflected in the books ordered in the 1849 account. The next two common works were each devotional manuals: the “Ursuline Manual” at 32 appearances and “St. Vincent’s Manual” at 30. “Pictures” – likely images of devotional scenes, saints, Christ, Mary, etc. – appeared 28 times, reflecting the popularity of devotional objects in mid-century Catholicism. While the great majority of items in the ledger are books, the frequency at which non-book items like “pictures,” “beads, and “medals” – along with crosses at 22 appearances and crucifixes at 18 – reflects a devotional world that would thrive through the century. Moving forward with this project, I will be working on understanding the unique titles being sold in 1849 and trying to trace when they were bought by the Jesuits. Using the import data for 1848 and 1849, I should be able to track the origins of books that were sold throughout the Mississippi and Missouri Valleys between May and September of 1849. This step will offer a broader look at the market for Catholic goods and will help show where the books being exported were coming from. This connection is a vital step to understanding the book trade and piecing together this literary world. Erik Berner returns with his next installment on secular legislation books in the original St. Ignatius College library collection. In this post he looks at British books in the collection, including some early and rare copies of the Magna Carta. One of the ways in which I have grouped the books listed in the Secular Legislation section of the original library catalog is by region. I have separated them into three applicable regions: British, Continental (Europe), and American (further subdivided into the colonial and national periods). The British grouping contains four works. Two of these works, copies of the Magna Carta from 1539 and 1602 respectively, are the oldest items in the catalog, and are both still held by the Loyola libraries. The other two — The English Lawyer by John Gifford, and The Constitution of England by Jean-Louis de Lolme — are no longer extant in Loyola’s collections. A digital copy is available of an edition of Gifford’s book printed five years earlier (1823), but with similar publishing details. Researching the de Lolme book touched off an interesting saga. The original library catalog lists an 1871 edition, but we have reason to believe that it might have actually been a 1781 edition, a possibility that will be discussed in detail later in this post. A charter granted to the rebellious noble barons in 1215 by the unpopular King John, the Magna Carta is often held up as a precursor to the Constitution of the United States and as a great originator of individual rights law for the people. This is not entirely accurate. In actuality, much as the Constitution of the United States was originally intended for a bourgeois citizenry (read: white, male, property owners), the Magna Carta, when issued by King John, was never actually intended to grant habeas corpus to John Commonman in Common Village, Commonshire, so to speak. It was intended to create a balance between the potentially despotic authority of the King and the rights that men of property, nobility, and privilege felt that they should have and exert against said authority. This, much as the general governing agreement between King William of Orange and the Parliament upon his installation on the throne, was intended to preserve the English Monarchy from rebellion, while giving those with money and title some power (and avoid such Cromwellian catastrophe as occurred in England in the century before the ascendancy of William). Titles page of the 1529 Magna Carta, still in Loyola’s collections today. Both copies of the Magna Carta listed in the catalog are still extant in Loyola Special Collections, in octavos of contrasting condition. The older, at first glance, seems in rough state. The spine is ripped and cracking, and some pages are just barely holding to it. Nevertheless, the pages themselves, and the print, are gorgeous and legible, at least in the sense of their appearance. Legibility in regards to language is an entirely different story. Though the first copy is specifically titled The Magna Carta in French, it is, in fact, largely in abbreviated Latin. (This is, according to the Smithsonian Institute, how an “original” copy would have been written: charters were transcribed in abbreviated Latin after the contents of the Magna Carta were agreed upon to facilitate faster delivery to the corners of the Kingdom). It seems too large to be just the text of the Magna Carta itself, and though I cannot read the Latin, and struggled with some of the Old French, I suspect that much of the contents are either texts pertaining to the many re-issuances by subsequent kings, or else other statutes entirely. Further research in Special Collections will be necessary to conclude this, as this book was very difficult to delve into, due to its condition. It was printed in 1529 in London by a publisher named Robert Redman. He, it seems, was the second “King’s Printer”. After the creation of the printing press, this became a position first held by Richard Pynson, and subsequently taken over by Redman under Henry VIII. The lack of any explanatory sections, particularly any in the English language, in the book, and the fact that the printer was royally affiliated, suggest to me that this was printed for legal, or personal knowledge use, of somebody in the Courts. How and why Loyola came to own it is a very interesting question. Title page of the 1602 Magna Carta in Loyola’s collections today. The second copy of the Magna Carta is in much better condition, though it may have been rebound at a later point. The binding, specifically, is one of the most interesting things about it, which I will get to in a moment. First, one must discuss the contents. The publisher of this book, Thomas Wight, is highly relevant to my project. He is known for being “one of the first publishers of English Law books,” according to Wikipedia. He lays out that purpose in no uncertain terms in his note “To the Reader” at the beginning of his edition of the Magna Carta. He explains that he has decided to compile both the Magna Carta, as well as other relevant English legal statutes into an edition “to bee had, perfect and readie, not onely by all Studentes of the law for their priuate Studies, readings, ootes, bolts, cafes, and other exercise, but also by the practice of the same for their dayly affaires and causes.” No guesswork is needed about the purpose of this book: printed in 1602, it was intended for personal reference of noblemen that learned law in the classic “Inns of Court” manner in the 17th century, in which law students attended court proceedings and were expected to take in the happenings and “learn independently” rather than taking on formal academic coursework for the law (a development that would not arise until later, see my previous post). He seemingly did not wish to change a single word of any of the statutes, as they alternate between Latin and Norman French (which would, at various times, have been the languages of use for laws by the Court in England). This also indicates that he simply put them down as is, creating a common law amalgamation of English precedents to be referred to by the law student. 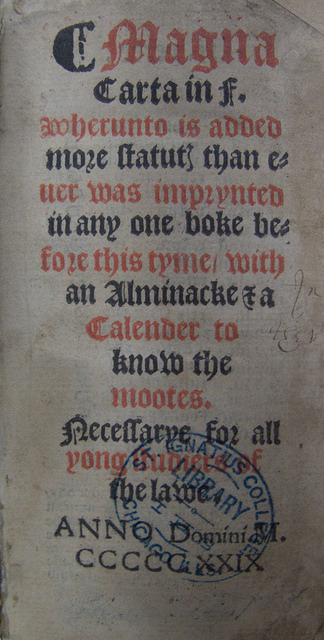 The age of this copy and how Loyola acquired it makes it of particular interest, but the binding also adds some mystery. Stamped on the leatherbound cover, on both the front and back is a golden initial: RB. Who was RB? For conjecture on this, as well as fascinating information on the publishing context of these charters, see Michael Albani’s post on the topic on the JLPP blog. Title page of a copy of Gifford’s English Lawyer from 1823, five years earlier than Loyola’s original copy. 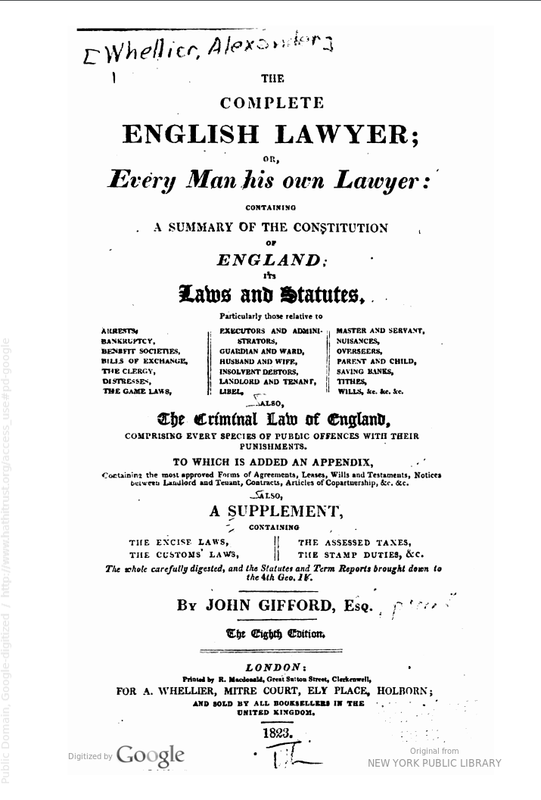 Gifford’s The English Lawyer, as its subtitle suggests, falls into the “every man his own lawyer” category of self-help law books we have discussed, which were popular around the time of the book’s creation. It was originally published in 1820 and St Ignatius College had an edition from 1828 according to the original library catalog. The nature and contents of Loyola’s copy, as gleaned from an 1823 online edition, would indicate that this was not necessarily the type of book that would have been used in an apprenticeship or Inns of Court law program (though due to the rather unstructured nature of pre-professionalized law schooling, any book that a student found useful could obviously have been referenced). Instead, this seems to be intended for the “common gentleman” to use for personal reference when partaking in the responsibilities of running a nineteenth-century household. As stated, the online edition found was not the same one originally owned by the Jesuits. Nevertheless, being printed only five years earlier, the book, I suspect, is not substantially different and that the basic themes and contents are the same. The book focused mostly on the types of things that a gentleman would need to know to go about his daily duties and responsibilities. The book gives a thorough presentation and explication of all manner of English property, tax, inheritance, and family law. These are topics that any noble or bourgeois citizen of the time would be expected to at least be passingly familiar with, not necessarily things that would be confined to the realm of those studying to be lawyers, reinforcing my previous assertion that this book was most likely not intended for law students. It is hard, obviously, to come up with too much solid information about the physical edition that the Jesuits owned. An attempt at conjecture was made, but not even the name of the publisher remains. Some deeper research will be necessary to come up with any concrete ideas about why the Jesuits would have acquired this book, or from where. 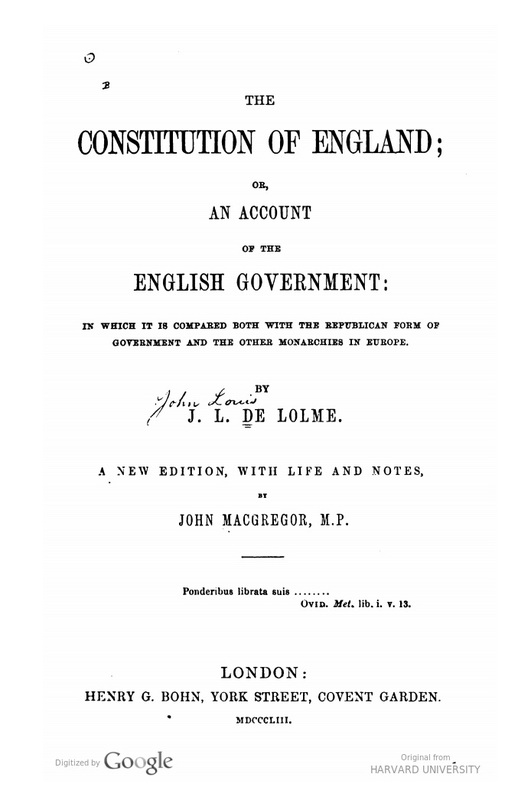 An earlier (1853) edition of de Lolme’s Constitution of England. The last of the UK books, and the second of the missing ones, is an edition of Jean-Louise de Lolme’s The Constitution of England. Jean-Louise de Lolme was, like many of the greatest legal commentators (think de Tocqueville), not originally from the country about which he wrote. Born in Geneva, de Lolme studied for the bar (presumably in the inns of court fashion described above) and originally wrote theoretical treatises. One of these in particular, about the nature of the rights of human beings (An Examination of the Three Parts of Rights) angered the authorities in Geneva enough that de Lolme went into exile in England. From here, he was able to take an outsider’s perspective of the English legal system, a system which, through its maintenance of balance between different classes, impressed him greatly. He decided to write about it in a proscriptive manner in the French language, presumably with the hopes of influencing French speaking people on the continent to strive for a system more like Britain’s. The book was first published in French in 1771. An English translation was made in 1775 in London by T. Spilsbury. It went through another English-language edition two years later before being printed by its most familiar English language publisher, John Murray, who reprinted it multiple times in subsequent years. De Lolme’s book belongs to the category of legal commentary more than anything else. The book is not a law book in the sense that it presents statutes or precedents. Rather de Lolme analyzes the English system of government, constitution, and, particularly, its “unwritten constitution” (what we would call the body of common law dictating the precedents the English followed). Though critical of certain aspects of the English system (particularly the feeling that the Parliament exerted too much influence over other branches of government), de Lolme, ultimately, holds the English model of balancing what he terms “the one, the few, and the many” or “monarchy, aristocracy, and democracy” to create what he feels is the most perfect of all the current systems. He gives his own prescriptions of how this balance might be improved and his suggestions on how its analysis could benefit the rest of the world. Indeed, at least some people in the rest of the world listened, though not perhaps the ones he had hoped would. Originally written in French, the cautious moderation of de Lolme’s politics, in the end, would not win out of the “direct democracy” ideals of his chief intellectual rival, Jean-Jacques Rousseau, when it came to political influences on the French Revolution. Some English were listening, however, particularly those on the other side of the Atlantic wishing to throw off the yoke of British monarchy. Many of the founding fathers of the United States cited de Lolme’s work as influential, and, indeed, one can see the debt the US Constitution owes to de Lolme’s idealized explication of the English one. In fact, if one looks at the legal books the Jesuits did not have (as well as the fact that they seemed uninterested in founding a “law school” when compiling their library), one begins to wonder if some of these books might have simply been collected in an ad hoc manner. Though some of these UK law texts are certainly considered essential, perhaps the most essential (certainly one of the most famous and oft-cited) English legal text of all is missing; William Blackstone’s Commentaries on the Laws of England. Throughout my research, both on the theoretical works that influenced the founding fathers, as well as the books commonly used in a self-teaching or inns of court style legal education, Blackstone’s Commentaries, seem to appear every time. Though the Jesuits may have specifically sought out copies of the Magna Carta or de Lolme, by leaving Blackstone out, it seems unlikely that there was a conscious effort being made to collect the canon of English legal texts. Loyola Master’s in History student Dan Snow is working this semester on sales of Catholic books in the Midwest through the unique lens of a ledger documenting the book trade run by the Jesuits in St. Louis between 1842 and 1849. Dan has been awarded a competitive Research Experience for Master’s Programs (REM) Fellowship to support his work by the Graduate School at Loyola University Chicago. Dan will be blogging throughout the semester about his work. For the last few semesters, I have been exploring an 1840s Jesuit book trade ledger from St. Louis. Prof. Roberts and I believe that this ledger offers valuable insight into the state of Catholic publishing and the advance of Catholic institutions westward during the mid-nineteenth century, and we have spent much time analyzing it. Over the course of the coming year, I will be working on the Jesuit Libraries Provenance Project in greater detail than I have before and during this time I hope to build on what I have done over past months to better understand this microcosm of the American Catholic world. Last semester, I primarily worked on transcribing the Jesuits’ sales between May and September 1849, the very last segment in the book trade ledger. The ledger can be a difficult document to navigate, filled with inconsistencies, shorthand descriptions, and other issues. Avoiding these, one can begin to understand what the Jesuits’ market looked like at mid-century. There were a total of 118 sales in this period. As of this writing, I have identified 47 unique purchasers for this period and 23 others who I have yet to identify. The majority of these purchases came from the Archdiocese of St. Louis, with many being from the city proper or from surrounding communities. largely centered around St. Louis. The 1849 orders can be segmented into a number of categories: religious orders (male); priests affiliated with the Archdiocese; parish priests in St. Louis; parish priests outside St. Louis; religious orders (female), and the laity. The two male religious orders were the Congregation of the Mission (St. Vincent de Paul’s group, known as the Vincentians) and the Society of Jesus (St. Ignatius Loyola’s Jesuits). Both the Jesuits and the Vincentians had a major presence west of the Mississippi at mid-century: in 1829 the Jesuits took over running St. Louis University (founded in 1818) and maintained a sizeable seminary at Florissant, while the Vincentians ran a seminary at Perryville and a second seminary further south in Cape Girardeau. Additionally, priests of the two orders ran a number of parishes throughout the St. Louis area. The Diocese of St. Louis was established in 1826 by Pope Leo XII and promoted to an Archdiocese in 1847 under Pius IX. It oversaw a vast area on the American frontier. Though it was established on French roots and had a proud history in the city of St. Louis itself, the Archdiocese was also responsible for a number of frontier missions and churches along the Missouri River into modern Kansas. The Archdiocese is worth separating from the churches under its control because its mission was very distinct from the respective parishes it oversaw. It would not be fair to compare the orders of St. Louis Cathedral (where books may have been distributed from to various institutions in the Archdiocese) to a parish church in Old Mines, Missouri which bought books solely for its own benefit. The purchases of the city’s archbishop, Peter Richard Kenrick, and his subordinates at the cathedral are frequent throughout the ledger. However, in 1849 Bishop Kenrick does not appear. The parish priests of the city of St. Louis are given their own category to separate them from the parish priests outside the city. While St. Louis was not a major population center on par with New York or Philadelphia, it could have seemed as such when compared to the frontier settlements many priests found themselves in. in 1850, St. Louis had around 77,000 citizens and was the largest city for hundreds of miles, serving as a hive of economic, cultural, and political activity. Compared to the recently incorporated city of Chicago, St. Louis was a metropolis. The Mississippi brought goods to the city from New Orleans and the city buzzed with new people and products. Immigrants settled in great numbers in the city, although many – especially Germans – were passing through on their way to frontier settlements. On the whole, the conditions of a priest in the city were incomparable to the conditions of a priest outside. While the location of churches “outside St. Louis” varied greatly and life at each one could involve varying degrees of difficulty, some separation from the city is necessary. The priests who lived outside of St. Louis occupied a unique place in the American frontier. Building their churches to serve a growing number of Catholic settlers, their parishes becoming the cornerstones of new towns. Most were centered near St. Louis, in communities like Old Mines or Potosi. Some lived in establishments so new that they lacked names, like the “German Settlement” in St. Genevieve County served by Rev. Joseph Blaarer. From their seminary at Florissant, the Jesuits sent missionaries into the West. Men like Father John Schoenmakers, who ran a mission in Osage County, Kansas, found themselves on the very forefront of the push across the plains. These priests, their experiences, and their needs were substantially different than their counterparts in the city. Priests were not the only ones buying books in 1849. Women religious were essential providers of education, healthcare, and welfare in many American cities during the nineteenth century and St. Louis was no different. In 1849, four individual nuns placed orders with the Jesuits, as did a number of religious orders including the Ursuline Sisters and the Sisters of the Visitation. Women religious operated very differently than their male counterparts. While priests were involved in many social programs, the limited clerical capabilities of Catholic nuns often saw them deploy their skills and talents more frequently in such programs such as education and healthcare. As a result, the works that they ordered varied greatly from their counterparts in groups like the Society of Jesus. The last segment of the 1849 order list is the hardest to identify. Laity – the non-clerical, ordinary Catholics who filled the pews of a Sunday Mass – were and still are crucial in the Church. Of the 23 or so purchasers who remain unknown in the 1849 ledger, at least twelve are laity. Their lack of a clear institutional affiliation makes identification difficult. One can have little hope of finding a “Mrs. Jones” who placed an order in September 1849, and yet the presence of non-religious individuals is an important part of this story. Their orders show how Catholicism was being transmitted outside the hierarchy of the Church, and how the laity were playing a part in the move of both Christianity and these specific books westward. With luck, some of these individuals can be identified at some point, but even examining their purchases offers some insight into their involvement in the larger movement. It may be hard to track down the Mrs. Jones who placed this order. So who were the most active purchasers during this period? Between May and September 1849, the top three purchasers were neither Vincentians nor Jesuits despite their large presence in the market. Rev. Simon Siegrist, a parish priest from St. Louis, had the most orders (six), followed by Rev. Simon Paris, the rector of St. Louis Cathedral (five) and Sr. Olympia (four). The presence of Father Siegrist at the top of the list is surprising as he was not seemingly high in the Archdiocese’s hierarchy nor was he a member of any order. Siegrist did order several German works, and it is likely that he served the city’s growing immigrant German population. Hopefully over the course of the coming semester I can uncover more about what he was purchasing and what his role in St. Louis might have been. Father Paris’s presence as the second most prolific purchaser is not surprising, however. As the rector of the Archdiocesan seat, he occupied a high position within St. Louis Catholic life and likely administered over a number of programs. Rounding out the top three was a woman, a nun named Sister Olympia who placed four orders in 1849. Her high number of orders reflects the work of a woman in education (in May 1849, for example, she ordered fifty catechisms). As a member of the Sisters of Charity of St. Joseph, Sister Olympia worked at St. Vincent’s Free School in St. Louis where she could put her catechisms to use teaching the city’s growing Catholic youth. In all, 1849 is a great year for analysis, one that has been well-identified in terms of purchasers (relative to the other years studied, it has a much small percentage of unidentified purchasers). With a good understanding of who the individuals making purchases were and where they were located, we can begin to look at what they were buying. Bianca has done amazing work analyzing the works purchased in 1846, noting that nearly 350 unique items were purchased in that year. 1849 has fewer purchases than 1846, but I anticipate that it has as much variation in the titles sold. A typical page from the ledger, showing orders in June 1849 from Father Siegrist, Father Dahmen, and Sister Genevieve. Over the next few weeks, I will begin marking each item ordered in 1849, organizing them by order number to keep track of who was buying what. By the end, I should be left with a list that shows each respective book ordered, the number of transactions that included a specific book, the number of copies sold in each transaction, and the price charged per copy in each order. Creating this list will open a number of different paths for further analysis, including comparing the prices the Jesuits charged their respective customers and which books were most widely bought. However, I am most excited to use the list of titles to begin investigating what these books said about mid-century Catholicism. I hope to conduct research on the titles, producing at a minimum a few sentences on each work in order to understand what these pioneer priests and Catholics were reading. My work for the last few months has been building towards this study and I am excited to begin working on it.